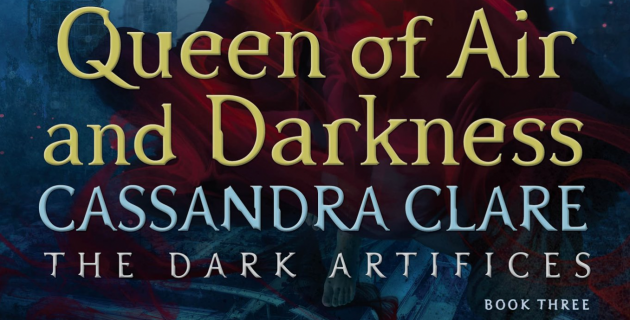 Since the shocking ending of Lord of Shadows, Cassandra Clare’s fans have been eagerly awaiting the final book in The Dark Artfices trilogy, Queen of Air and Darkness. We’ve only had a few snippets so far and one piece of artwork so everyone is always super excited whenever Cassie has something to share about her upcoming book. We know she’s working on it right now and the time has come to share the 2018 release date and the cover of Queen of Air and Darkness! Are you ready?? We LOVE it! The red is such a stunning contrast to the different shades of blue. Annabel looks great, but we are worried because of the buildings and the destroyed highways (background/bottom of the cover). The cover is of course a throwback to the other two covers where we had Emma and Julian floating underwater. Like every single Cassandra Clare book, the cover was designed by Cliff Nielsen. Don’t forget to zoom in to catch all the other details! He wanted to ask Ty if he was all right, but he knew the other boy wouldn’t want it. Ty was staring at the Market, tense with curiosity. Kit turned to the phouka. Ty’s gaze snapped to attention. The phouka was tall, dark and thin, with bronze and gold strands threaded through his long hair. He wore purple trousers and no shoes. The lamppost he leaned against was between two stalls, neatly blocking the way into the Market. “He knows you,” muttered Ty. “Everyone in the Shadow Market knows me,” said Kit, hoping Ty would be impressed. The phouka stubbed out his cigarette. It released a sickly-sweet smell of charred herbs. “Password,” he said. “Say what? What’s the password?” Ty demanded. The phouka grinned. “Wait here, Kit Rook,” he said, and melted back into the shadows of the Market. “He’s going to get Hale,” said Kit, trying to hide the signs of his nerves. It was like standing outside a lighted room in the dark, Kit thought. And though Ty might not express it that way, Kit suspected he felt the same. “If they can, they’d never show it,” he said. 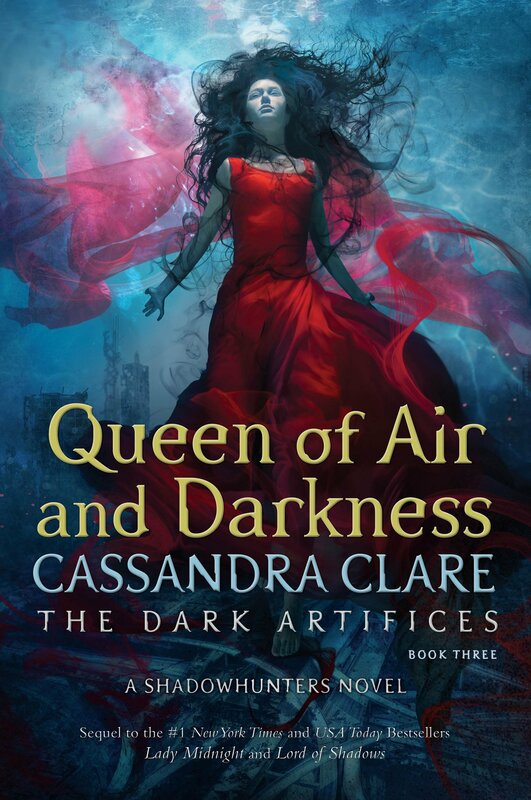 Queen of Air and Darkness is published on December 4, 2018 – that’s in 388 days! Catch up with all the other snippets that Cassie has shared so far here. Leave a comment below or tweet us your thoughts (@TMI_Source) about the cover and what you’re most looking forward to in book 3! I’m just so thankful she’s releasing her short stories collection on ebook to tide me over. I’m on pins and needles waiting to see how they resolve the Clary storyline (please don’t let her die). I hope Jemma gets resolved in a way that doesn’t make me sad. I’m worried vaguely that they’ll banish Jules and Emma somewhere for character development for TWP. I just hope they’re happy and together and I hope no one I love as a character dies (though that’s very unlikely). I’m super curious about where Jules and Emma go that the shadowhunter universe hasn’t shown us yet. Maybe the afterlife….Thule? I think it’s cool Annabelle is on the cover though I’d guess it means her character becomes more heroic in the end (like Jessamine). I think it’d tie in nicely with Emma remembering Arthur’s comments about mercy at the end of LoS. So many thoughts…..too long to wait. What a beautiful cover! The red stands out well. Even the snippet of Kit and Ty helps to keep use looking forward to the long wait. I hope the next snippet will be of Mark/Kieran. is Annabel on the cover, or is it Cristina? Is it already confirmed that it is Annabel? That’t too long!!! No!!! I want it now!!! P.S. I absolutely adore Julian and can’t wait to see what he would do. The last book seems to have been written only to be “Hollywood politically correct”.